• The new DSM-III and the Feighner criteria give definitions of schizophrenia that are restrictive in that they require six months of illness before the diagnosis can be made. 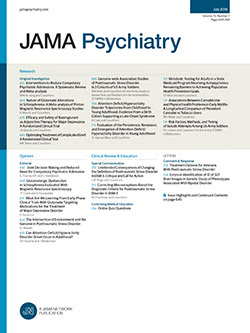 The definitions are compared with definitions of schizophrenia in the Research Diagnostic Criteria and CATEGO in terms of predictive validity using a cohort of 125 psychotic patients from the United States-United Kindgom Diagnostic Project. The results showed that while the DSM-III and Feighner definitions were more restrictive, they also had a higher degree of predictive specificity than the other two definitions. No patient diagnosed by DSM-III or Feighner criteria showed a change in diagnosis over time, and these patients were more likely to have presistent schizophrenic symptoms and to have social handicap. The appropriateness of the requirement of six months of illness and the practicality of using outcome as a validity measure are discussed.